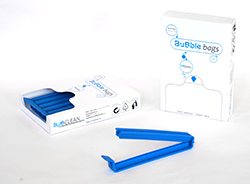 Use your BuBble bags more effectively using the accessories that we specially selected and designed. Watch the short movie on the right for 7 tips&tricks on the optimal use of the BuBble bags. All accessories can be obtained through the webshop. The rod is tailor made for your ultrasonic bath, in order to make it fit exactly on the ultrasonic bath. 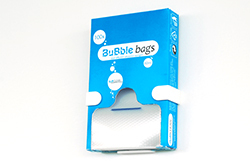 The dimples in which the BuBble bags are hung, will be positioned at the optimal locations (hot spots) inside your bath, in order to achieve optimal cleaning. For easy mounting of a box of BuBble Bags to the wall, and keeping your desk free of extra boxes. Mounting is simple using the enclosed double-sided tape; alternatively there are screw holes in the bracket. 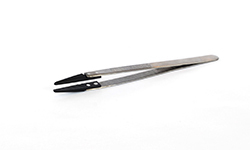 The tweezer (length 150 mm) allows you to easily retrieve cleaned objects from the BuBble bag. Ideal for filling the BuBble bag with one hand and with the correct amount of cleaning liquid. 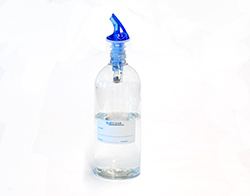 Volume 500 mL, dose 20 mL. The durable plastic clips allow for closing and handling the bag without spilling.